Step 1. Click the 'Wi-Fi Hotspot' button to create a wireless hotspot. Step 2. Select your Ethernet adapter (or any adapter that has a connection to the Internet). Step 3. 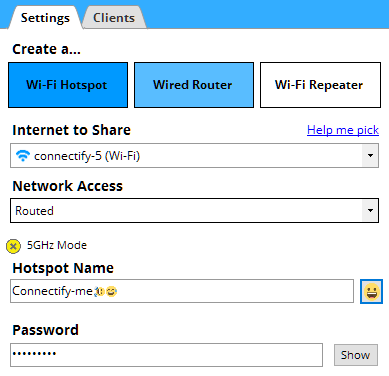 Set a Hotspot Name (SSID) and Password. Step 4. Click the 'Start Hotspot' button. From your phone or tablet (or any other wireless device), you should be able to see and connect to your wireless hotspot! 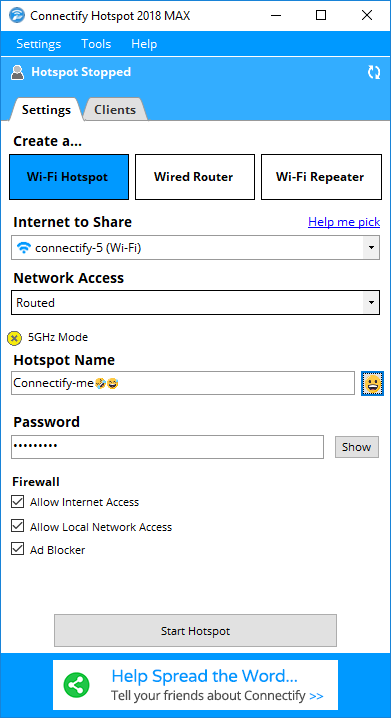 Get the most out your Connectify experience by upgrading to Connectify Hotspot PRO or MAX here!